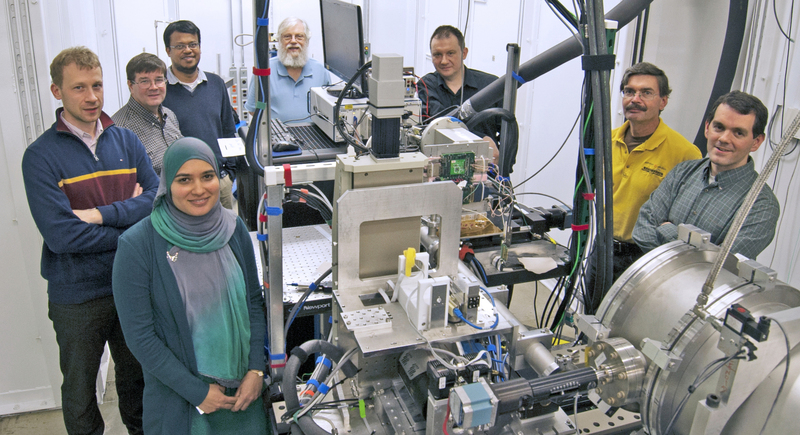 A collaboration blending research in DOE’s offices of High-Energy Physics (HEP) with Basic Energy Sciences (BES) will yield a one-of-a-kind X-ray detector. The device boasts Brookhaven Lab sensors mounted on Fermilab integrated circuits linked to Argonne Lab data acquisition systems. It will be used at Brookhaven’s National Synchrotron Light Source II and Argonne’s Advanced Photon Source. Lead scientists Peter Siddons, Grzegorz Deptuch and Robert Bradford represent the three laboratories. “This partnership between HEP and BES has been a fruitful collaboration, advancing detector technology for both fields,” said Brookhaven’s Peter Siddons. This detector is filling a need in the X-ray correlation spectroscopy (XCS) community, which has been longing for a detector that can capture dynamic processes in samples with microsecond timing and nanoscale sensitivity. Available detectors have been designed largely for X-ray diffraction crystallography and are incapable of performing on this time scale. In 2006, Fermilab’s Ray Yarema began investigating 3-D integrated chip technology, which increases circuit density, performance and functionality by vertically stacking rather than laterally arranging silicon wafers. Then in 2008 Deptuch, a member of Yarema’s group and Fermilab ASIC [Application Specific Integrated Circuit] Group leader since 2011, met with Siddons, a scientist at Brookhaven, at a medical imaging conference. They discussed applying 3-D technology to a new, custom detector project, which was later given the name VIPIC (vertically integrated photon imaging chip). Siddons was intrigued by the 3-D opportunities and has since taken the lead on leveraging Fermilab expertise toward the longstanding XCS problem. As a result, the development of the device at Fermilab — where 97 percent of research funds come through HEP — receives BES funding. A 64-by-64-pixel VIPIC prototype tested at Argonne this summer flaunted three essential properties: timing resolution within one microsecond; continuous new-data acquisition with simultaneous old-data read-out; and selective transmission of only pixels containing data. The results achieved with the prototype have attracted attention from the scientific community. Deptuch noted that this partnership between BES and HEP reflects the collaborative nature of such efforts at the national labs. “It truly is a cooperative effort, combining the expertise from three national laboratories toward one specific goal,” he said. 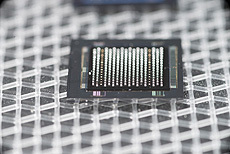 The team will grow their first VIPIC prototype tiled, seamless array of chips on a sensor to form a 1-megapixel detector. The collaboration is targeting a completion date of 2017 for the basic functionality detector. Ideas for expanded capabilities are being discussed for the future.